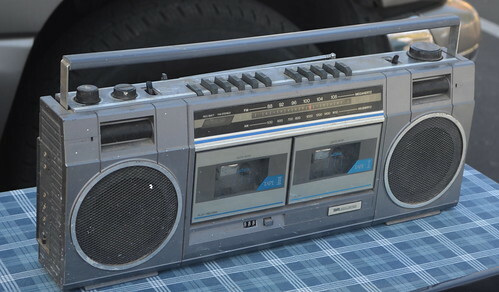 At the flea market last week I found this boom box. This is the same boom box that was the first piece of consumer electronics I ever bought myself. My brothers and sisters had a lot of cassettes when I was growing up. It was easier to convince them to let me borrow the tape for an afternoon than for a week. Lets say I made a lot of copies and made a lot of mix tapes. This did not teach me to never pay for music. This taught me to love music. The bet thing about love is when it is shared. It got me to want to tell people when I found music that was great. I think this is something the entertainment industry should try to remember.